When speaking about global geography, it is helpful to break the world map into large geographic zones. While some people and organizations refer to the seven continents as geographic zones, the U.S. Department of Homeland Security categorizes countries into specific regions. Each of these eight regions contains its own mix of geographic features and biomes. The U.S. Department of Homeland Security breaks the world map into eight distinct geographic regions: Africa, Asia, the Caribbean, Central America, Europe, North America, Oceania and South America. Each of these regions contains a different mix of biomes and geographic features. Africa contains countries such as Libya, Niger and Zimbabwe. The weather across most of Africa tends to be hot and dry with little rainfall. Some of the world's most famous wildlife including lions and elephants inhabit this zone. 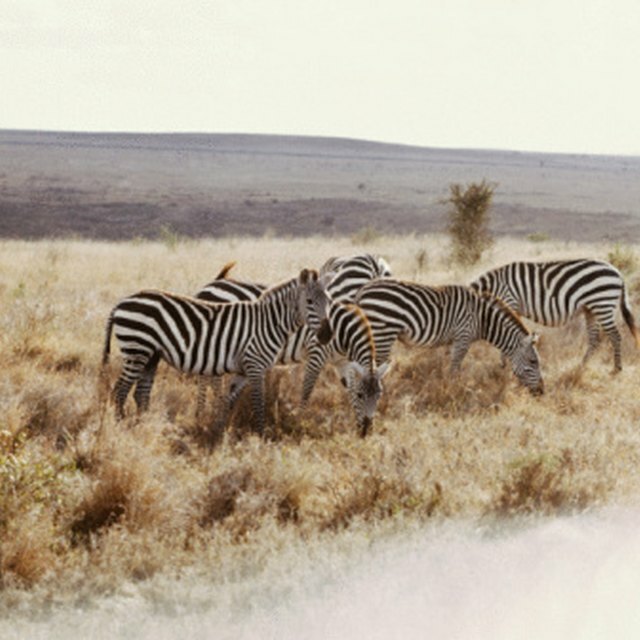 These animals have perfectly adapted to handle Africa's range of biomes. Biomes are environments classified by weather and the adaptations of the living things that inhabit them. There are five biomes: aquatic, desert, tundra, forest and grasslands. Africa contains three of these: deserts, grasslands and forests. As a result, Africa has a diverse array of plants, animals and weather. Africa is also geographically diverse. The tallest peak is Mount Kilimanjaro with a summit of 19,340 feet, while the famously flat Serengeti Plains stretch on for 12,000 square miles. Asia contains countries such as Iraq, India, Japan and China. Asia is stunningly diverse, containing all five of Earth's biomes. The Caspian Sea, the world's largest inland lake, is bordered by several countries in this region, including Kazakhstan and Iran. The Gobi Desert, the largest desert in Asia, covers more than 500,000 square miles, while Asia's largest grassland, the Central Anatolian steppe in Turkey, stretches on for nearly 10,000 square miles. Asia is home to the world's largest forest, the Taiga, as well as several alpine tundras, such as the one that tops the Himalayan mountain range in Tibet. Familiar Asian animals include tigers, pandas and snow leopards. The Caribbean region consists of islands and coasts in or around the Caribbean Sea. It contains countries such as Aruba, the Bahamas and Saint Lucia. The majority of the Caribbean boasts a warm, tropical climate, with many of its islands being popular vacation destinations. However, this region can be prone to tropical storms and hurricanes. The Caribbean contains just two of Earth's biomes: the aquatic and forest biomes. The rainforests found in some parts of the Caribbean, such as the Guajataca rainforest in Puerto Rico, are rich in wildlife. Animals such as macaws and poison arrow frogs thrive there. Ocean wildlife in the Caribbean includes sea turtles and dolphins. Central America contains the smallest number of countries in any of the eight geographic regions. These countries are Belize, El Salvador, Costa Rica, Guatemala, Honduras, Nicaragua and Panama. Central America's climate is mostly warm, with temperate to tropical climates. Like the Caribbean, it contains only the forest and aquatic biomes, but it is rich in wildlife. Animals such as ocelots, capuchin monkeys and crocodiles call this region home. Central America contains some of the most active volcanoes on Earth, including the Santa Maria volcano in Guatemala, which has been active for more than 100 years. Europe contains countries such as England and Ireland, as well as the world's largest country: Russia. Europe is home to all of Earth's biomes except for the desert biome. From the famous Lake Loch Ness in Ireland to the Siberian Tundra in Russia, Europe is geographically diverse. Southern Europe is mountainous, with the highest mountain peak being Mont Blanc in the Alps at a height of 15,778 feet. Flat, grassy plains are common throughout Eastern Europe. Europe contains 24 large lakes, the largest of which is Lake Vänern in Sweden. Some of Europe's most famous wildlife includes hares, lynxes and hedgehogs. North America contains countries such as the United States, Canada and Mexico as well as some countries within the ranges of the Caribbean and Central America. North America is one of the most biologically and geographically diverse regions, containing all five of Earth's biomes. Interesting geological formations in this zone include the Rocky Mountains, the Kalaallit Nunaat tundra in Greenland and the Everglades swamp lands in the southern U.S. Weather varies greatly throughout the North American region. Temperatures on the tundra can average minus 30 degrees Fahrenheit, while in the U.S., the Mojave Desert reaches temperatures of over 130 degrees. Because of these varied environments, North America contains a diverse array of life from alligators to polar bears. Oceania contains countries such as Australia and New Zealand along with many small islands, such as Christmas Island. Four of Earth's five biomes can be found in this region, with the exception being tundra. The Australian Outback is one of the most famous desert regions in the world with summer temperatures averaging over 100 degrees Fahrenheit. Meanwhile, some island nations in the Oceania region, such as Papua New Guinea, boast tropical rainforests. Some of the well-known animals in this region include kangaroos, Christmas Island red crabs and kiwis. South America includes countries such as Chile, Peru and Argentina. This region contains only the desert and forest biomes, but more plant and animals species can be found in South America than in any other region. This is because of the Amazon Rainforest, which stretches through most of Brazil. The Amazon is the largest tropical rainforest on Earth, boasting more than 10 million plant and animal species and producing about 20 percent of Earth's oxygen. South America also contains the world's longest continuous mountain range – the Andes Mountains – which stretch along the western edge of South America. Well-known South American animals include jaguars, sloths and capybaras. Cook, Maria. "The 10 Geographic Regions of the World." Sciencing, https://sciencing.com/10-geographic-regions-world-8774247.html. 17 April 2018.